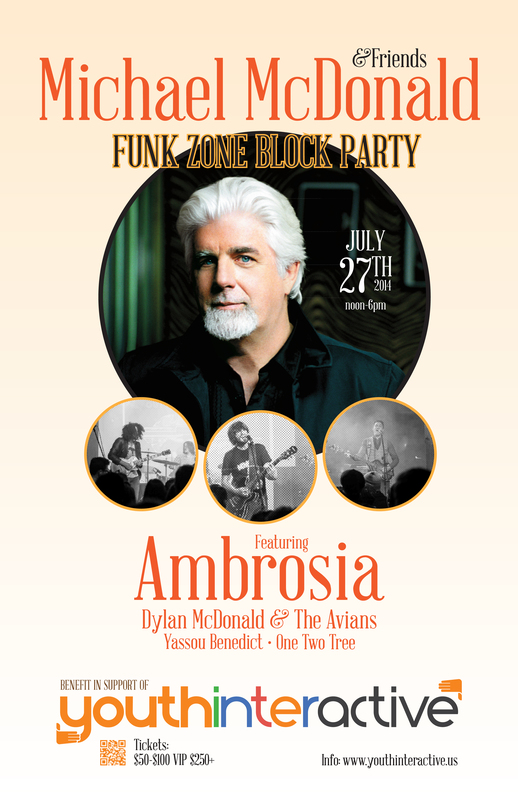 Santa Barbara, CA July 8 – Santa Barbara based non-­‐profit, Youth Interactive, is excited to announce the first “Funk Zone Block Party” on July 27th featuring Five-­‐ time Grammy Award Winner Michael McDonald. The concert which will run from Noon to 6:00 PM will also include performances by Five-­‐Time Grammy Nominees Ambrosia, Yassou Benedict and Dylan McDonald & the Avians. All proceeds from the fundraiser will go to the Youth Interactive Entrepreneurship Academy in Santa Barbara, whose mission is to bridge the opportunity divide for low-­‐income teenagers by providing tuition-­‐ free after school enrichment programs. Youth Interactive’s approach is to serve students T.E.A. – Technology, Entrepreneurship and the Arts to teach practical life skills, financial literacy and success through entrepreneurship. The non-­‐profit organization partners with local schools, the City and the County to provide a path to life success for Santa Barbara County’s most creative, yet disadvantaged and disenfranchised youth. Students are given the opportunity to create micro-­‐businesses assisted by business mentors. Using the resources provided at the academy, students develop entrepreneurial skills in various crafts including cooking, fashion, art and graphic design. They then earn profits from the sale of the products they have created. They also earn school credits. The Youth Interactive Entrepreneurship Academy in Santa Barbara offers TEA (Technology, Entrepreneurship and Arts) at free after school programs. Their mission is to bridge the opportunity divide providing low-­‐income teens with real life experiences needed to succeed in any industry.